Oliver had a good day today – very quiet and subdued, but that’s what he’s supposed to do. The doctors do want him moving around a bit so that he can work out some of that edema and fluid build-up and he was feeling pretty spry at certain times of the day. He does love his boiled chicken and rice. 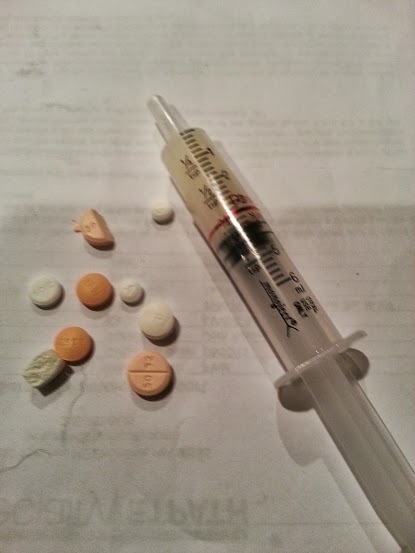 For the record, this is his pill dose – twice a day. 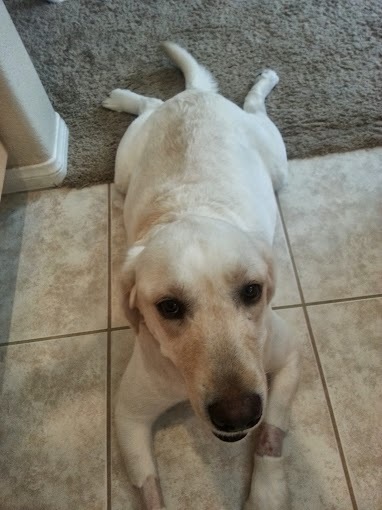 And, also for the record,we can’t decide if he looks like a beached beluga whale or a baby albino hippo. Either way, and all kidding aside, we are seeing the swelling and fluid build up going down – slowly. Follow up appointments with specialists have been scheduled. Now on to the Toys . . . Dads went on vacation, as we mentioned, and had a brief stop in one of The Buck-White Boys’ favorite places, Seattle! And, even more specifically, Pike Place Market. We have chewed this, tugged it, dragged it around and every foster that came through took their time with it as well. Sure, it’s a little frayed in some places, but it’s holding up REALLY well! Well, we’ve all talked about that toy for three years and we’ve even sent people also passing through Seattle to pick ’em up. We seriously love this thing. And wanted more. Guess what! Looks like this has turned into a really good business for these people – they’re called Adventure Day Treats and they also make what sound really yummy, all-natural treats. We think Tucker should try the Breath Nuggets and Barclay ought to have a crack at the Calming Nuggets, don’t you think. 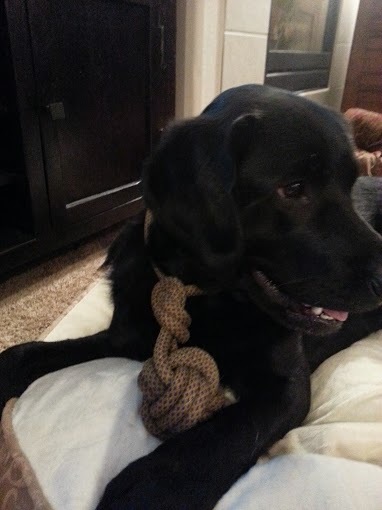 But, of course, the real draw was THE ROPE TOYS! 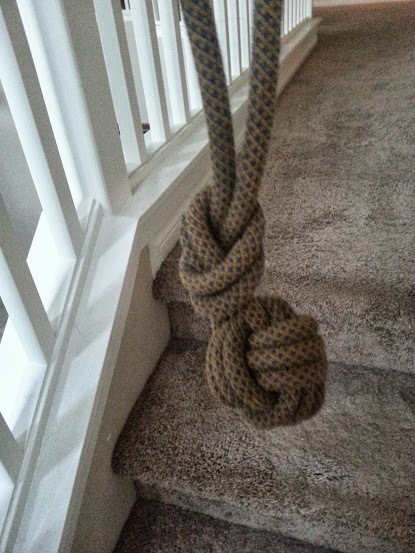 They call ’em the “Monkey-Fist Tug” and they are just as much fun as we remember! You can tug ’em, you can chew on ’em, you can fling ’em around (gently and if you’re outside). Here’s the thing, though, they are so well made they don’t fall apart. 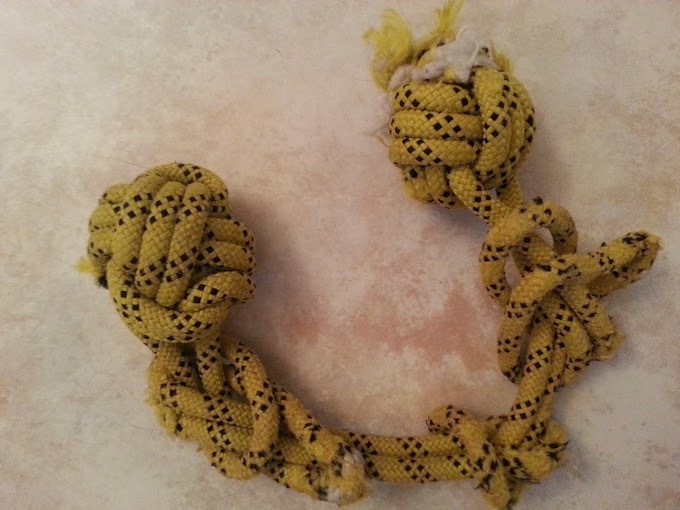 A lot of rope toys come apart once you start chewing on them, or they get so frayed so quickly that they’re not fun and leave shreds all over the house. 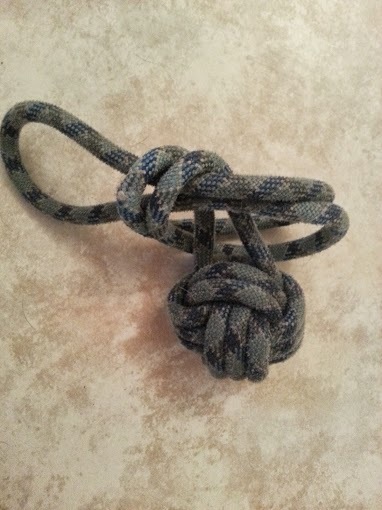 These “monkey fists” are the real deal and are super, super awesome. 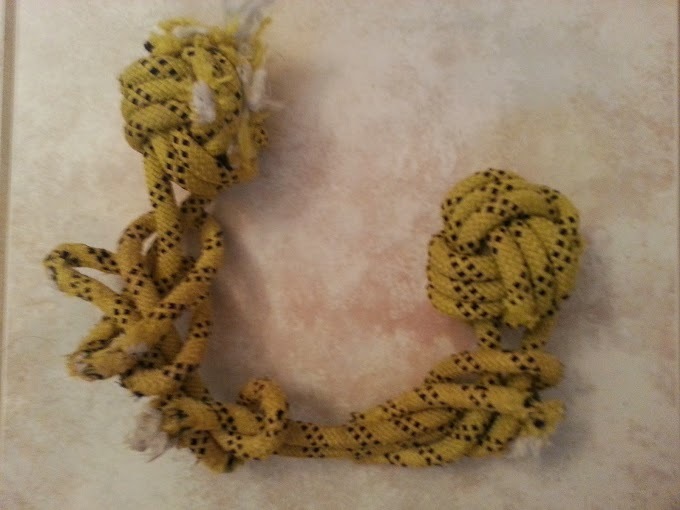 They also make other kinds of pulls and rope toys – different materials and different sizes. There are also these really cool leashes. And treats. Did we mention the treats? And gift baskets. Of treats. 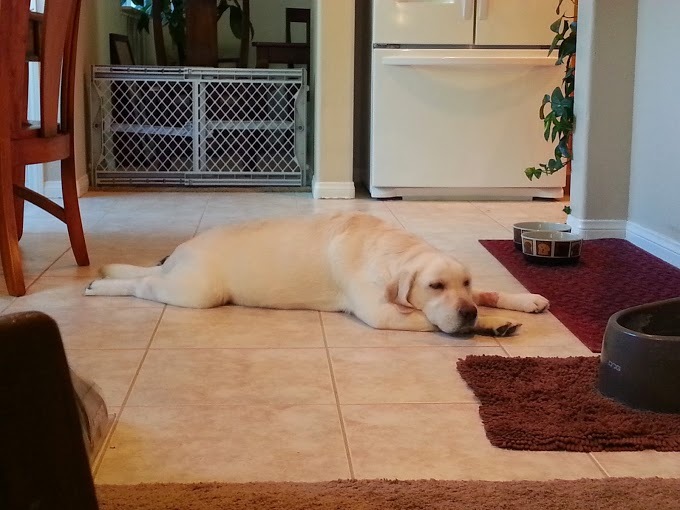 We might be hungry . . . . we’re labs and we’re awake, so, yes, we’re hungry. Definitely go check these out on their website www.adventuredaystreats.com. Looks like you can order them online – they’re worth getting your paws on, especially if you’re a big chewer or tugger. Or, even better, make a trip to Seattle and visit them in Pike Place! Super Goodness on the Las Vegas Strip! Yowza, we’re bad dogs, bad, bad dogs when it comes to blogging . . . thanks, everyone, for staying in touch via Twitter and Facebook. Dad travels a lot and we need help with all of this so we’ve found we can pretty much handle Facebook consistently what with the lack of thumbs and all, so that’s where we post most. By the way – we only have 94 “Likes” on Facebook. What is up with that? We get more hits on a daily basis, but it’s that hard for y’all to click “Like”? Hey, we’d appreciate the love and the sharing . . . ANYWAY! 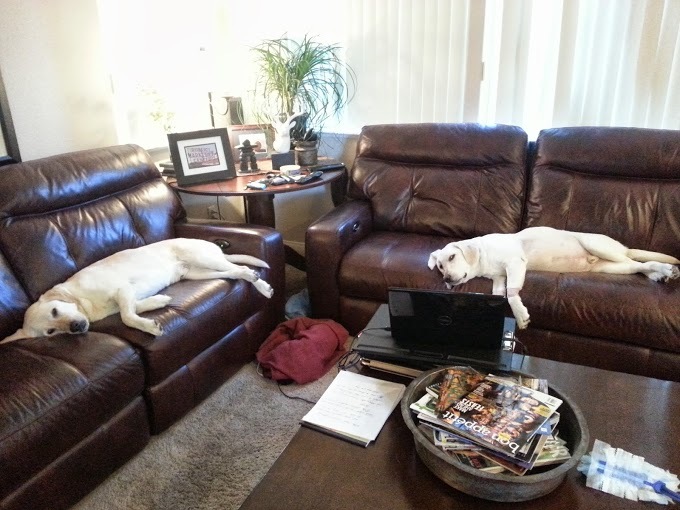 Had to check in ’cause we just got back from SuperZoo 2013! This is the largest trade show for pet products, retailers, services, etc. and it’s at the Mandalay Bay right up the street from our house. And our awesome, bestest friend gets us passes ’cause she knows how much fun we have. We had a blast this year – so we thought we’d put together some of our favorites, stand-outs and great ideas we came across. The over-arching theme is, just like any industry, it’s like the majority of what you see is a re-interpretation of what you saw at the last booth. There must have been at least 10 different manufacturers of poop bags. Nope. Not kiddin’. So, you really start to crave the different, the exciting, the new or the completely different interpretation of an old standard. This list is by no means comprehensive, just what we came across, and does not mean that anyone not mentioned was un-liked or we disapproved, these were just the stand outs. The “mouth feel” is AMAZING! These guys are super nice, awesome guys . . . there’s a lot of love behind these toys. What’re you waiting for? Go buy one now . . . NOTE: don’t leave ’em unsupervised, ’cause, no, they will not hold up to being a chew toy. That’s not what they’re designed for, though. OK, next up – we loved everything at Dublin Dog. COOL collars and leashes – unusual and different materials. They call some of ’em the “no stink” collars, but we think they just look cool. We think the Buddy Beacon is an idea whose time has come and we’re SUPER excited about the new toys they were showing off . There’s one called the Gripple that we can’t wait to get our paws on! And wait’ll you see the line of beds and mats they’re coming out with — totally different design than we’ve seen before and we want one bad! Found a new place called Fluff & Tuff that looks really, really promising. Really fluffy, adorable toys but sewn Labrador tough. We are so itching to try these out, we can’t stand it. That itching may be allergies, too, but we thought these were cool. Yellow Dog Design is another one that has really cool, different stuff . . . just really neat, nifty fun collar designs and cool stuff. We LOVE the Island Style collars. The folks at Relief Pod are making pet-specific safety and first-aid kits for travel. They’d be awesome for hiking, car trips, general around-the-house use — really neat, smart idea that’s one of those, “Why didn’t we think of that?! ?” Sadly, the pet kits aren’t listed on their website, but they do sell them via SkyMall our dad happens to know. The great food find of the month is Merrick . . . oh, man do we love this stuff. We’re on the grain free stuff ’cause of our allergies – it is so wholesome and good and healthy and WOW do we love it. Right? RIGHT?!?! For dogs that don’t have an in-ground pool (’cause their dads apparently hate them), how PAWESOME would this be? We totally want one. Right now. Met the President/CEO – what a really nice guy, clearly stands behind his product and dads got to actually see it. Super strong, super sturdy. We’ll report more once it shows up. Which it better do while there’s still summer to enjoy it. OK, a lot of words, we know and not many pictures. But we wanted to share the really cool stuff we came across — look for it at your local pet store or via really good online retailers. Remember, though, as much as you can, shop locally and support small businesses! And if you’re in Vegas, head over to Barking Dogs Self Wash and Grooming ’cause we have a hunch they’ll have some cool stuff coming in from SuperZoo in the not too distant future. It’s been awhile since a Toy Review Tuesday, huh? Today we get to feature one of our favorites . 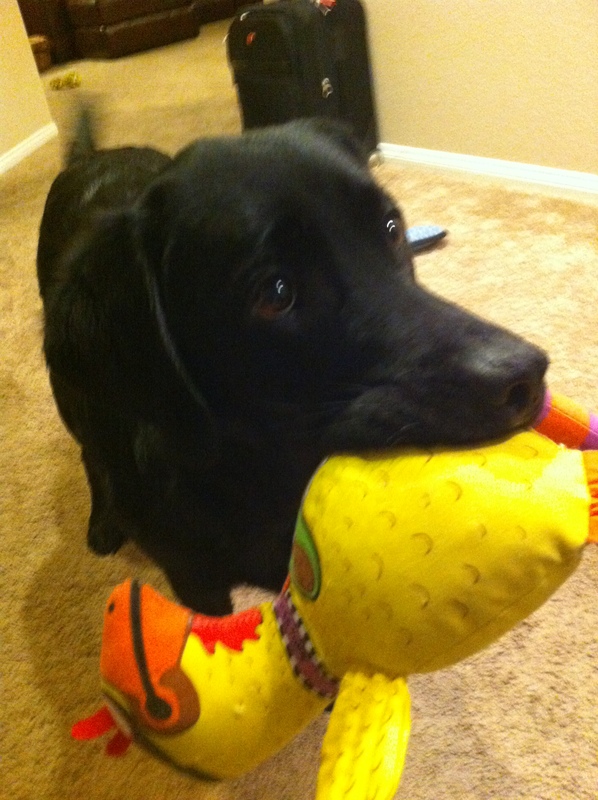 . . maybe even THE penultimate favorite toy. Suspicious Chicken. 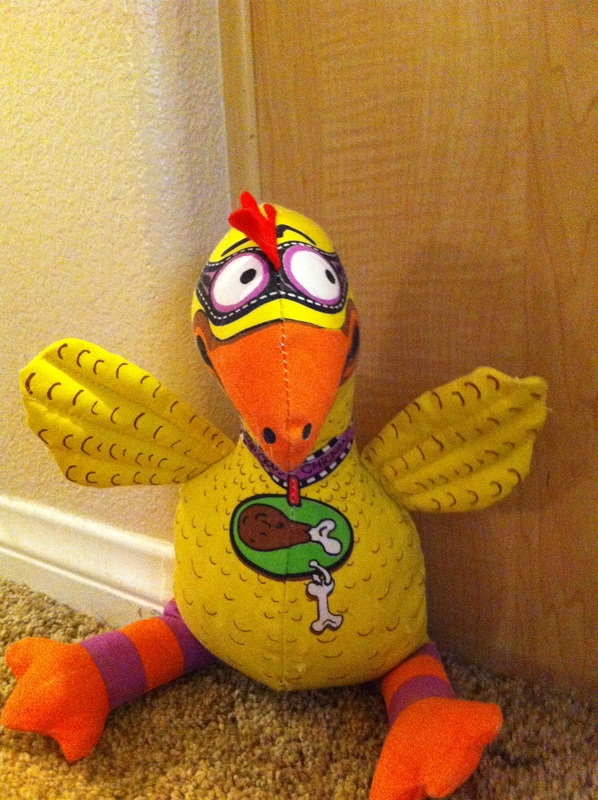 We are on our fourth, or fifth, Suspicious Chicken and we keep getting them because they’re awesome! We tug ’em, toss ’em, carry ’em around, fling them off of things, leave ’em in the dirt . . . really one of the toughest toys we’ve found. Suspicious Chicken is made by the fine folks at Fat Cat, which is a division of PetMate – they make all kinds of stuff, but Suspicious Chicken gets our vote for favorite. “Creative Design” and “Outrageous Humor” sound right up our alley! In the description, they say SC has “Maximum Floppability”! It does . . . it’s made out of a really tough canvas with really tight seams, but the legs and wings are sewn individually, so it holds up to tough chewing, tossing and tugging. It might fray around the ages, and bits might dangle off of it, but we’ve never seen the seams separate or stuffing come out (’cause we do love to vivisect our toys now and again). 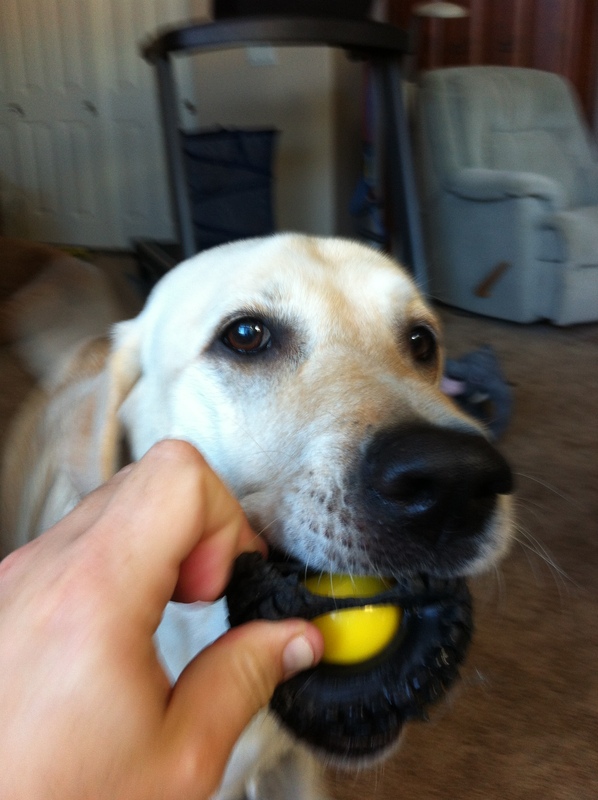 It’s the right size to fit in our mouths, great to chase, great to drag around – this is just one durable, long-lasting, wonderful toy and no lab should be without one. Pretty much any place that sells dog toys has ’em (even Target) so they’re pretty easy to find – let us know what you think when you pick one up! But, hey, don’t just take our word for it . 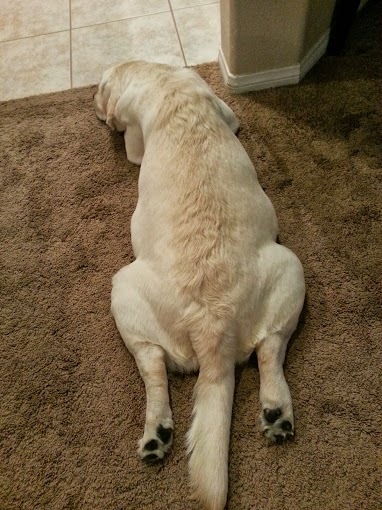 . . check out this picture we found when Google-ing “Suspicious Chicken”, click on it to go to that blog and see what they had to say about it. We’re not alone in our love of the ol’ SusChick!! PLEASE BE SURE TO CHECK WITH YOUR VET before starting any kind of food supplement or treatment for your fur-kids; we’ve talked with our vet about the symptoms and issues and she agreed with us on the treatment. We swear by The Honest Kitchen – if you don’t know them, they are definitely worth checking out. And pumpkin can be very good for pups with digestive issues, but, again, check with your vet first. Whatever you do, don’t say, “Awwwwww!” Bet you can’t avoid it. Christmas is ONE WEEK FROM TODAY! Not that we’re excited or anything. We’ve been busy, busy, busy and got a little behind on our blogging, so bear with us while we get caught up. And this will really be our last “Toy Review Tuesday” of 2012 so we wanted to make it really special and share our favorite holiday toy. 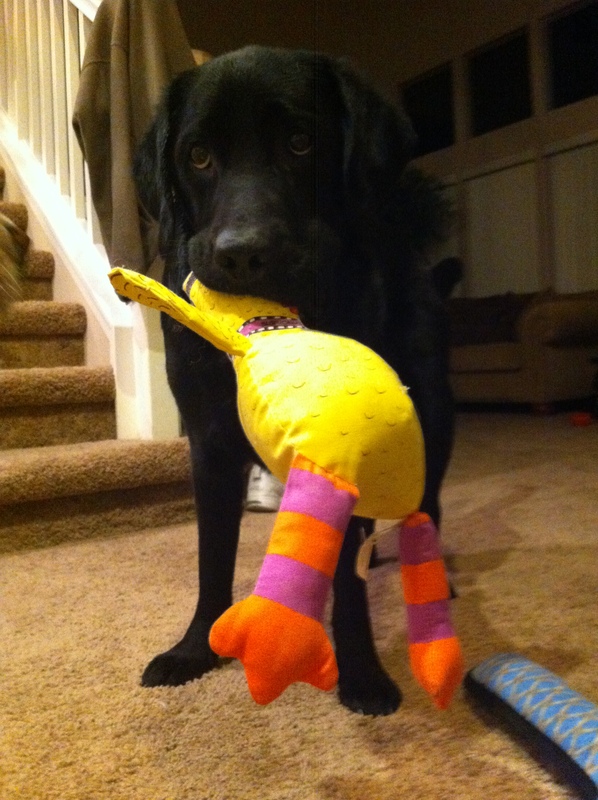 Actually, it’s Barclay’s favorite holiday toy and you’ll see why in a minute. This week’s Toy Review Tuesday – Christmas Edition features . . . The Really-Obnoxious-Jingle-Bell-Playing-Hand-Puppet-From-Hell, or ROJBPHPFH for short. Remember Odie from the Garfield comics? Yeah, it kind of looks like Odie – but on meth cut with yellow snow. As you can see, they love it. Barclay loves anything that makes noise and moves. Trouble is, when he gets a hold of it, it’s toast – so the ROJBPHPFH only comes out for very, very special occasions. (Buck-White Boys Dad’s Note: Let’s be really honest – this is not a dog toy and giving a dog anything that has small electronic parts, batteries, on/off switches and the like can cause a safety hazard, a potential for choking and other concerns. Please be very careful in allowing your pets to play with anything like this. The Boys have never been allowed to get ahold of this toy; it is only used in very, very special occasions during playtime and the boy’s are given a treat or bone following a session which is very well supervised by two responsible (a-hem, no comments, please) adults). But it is a heckuva lotta fun when used appropriately and safely! Thanks for helping us kick off Toy Review Tuesday this year. If you have any favorite toys you’d like to see reviewed, let us know and we’ll be happy to take a shot at it. Looking forward to some great toy reviews in 2013. We’re thinking a stuffed Mayan calendar with squeakers might be a good idea. Now it’s time to get caught up on the 12 Days of Buck-White Christmas. And-a-one, and-a-two . . .
Don’t these look like a lot of fun from Greg Robert Pet Supplies? Which we discovered while Googling tennis ball images. It’s beginning to look a lot like . . . . . stuff we wanna get for Christmas!!! We’re having a very hard time controlling ourselves ’cause they brought a tree IN THE HOUSE and then put all these balls ALL OVER IT and then yell at us for touching it. So, that makes this Toy Review Tuesday even more important ’cause we need a distraction. OK, it’s kind of been through a lot since that Christmas of 2010 but it’s holding up really, really, really well. Oh! What is it? It’s a Tugzee from A Cheerful Pet! 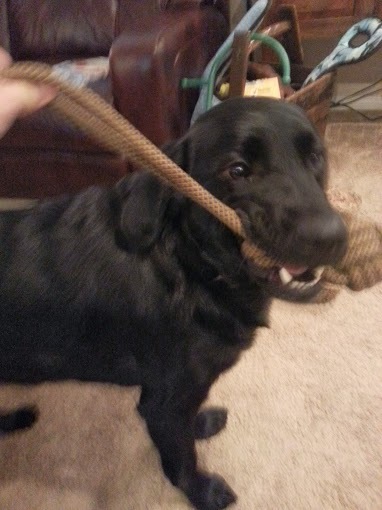 Essentially it’s a super long tug toy — ours is about six feet long, maybe? It’s perfect for lazy daddies who want to sit on the sofa and complain about how out of shape they are while we tug our little hearts out! It’s got a handle on one end and a ball-shaped, uh, ball at the other end. With fringe. So, like, you can throw the ball and we’ll chase it and grab it and then tug on it. It’s like the best of both worlds!! By purchasing our products, you are helping Nepali women provide for their families and giving them an enriched quality of life. Also, any product purchased from our PUMA collection provides food, shelter and education for the children of the PUMA orphanage in Nepal. For more information on PUMA, please visit www.puma2000.org. So, if you get any of their products or toys, you’re getting an awesomely fun, durable dog toy (that’s Buck-White Boys endorsed, for what that’s worth) and you’re helping people in another part of the world. It’s a win-win. You should get a bunch! And send them to us if you don’t want them all. We got ours — of course! — at Barking Dogs Self Wash & Grooming in Las Vegas (’cause they’re super cool and have a real philosophy of giving back and supporting communities so it makes sense they sell them!) But you can contact A Cheerful Pet and find out where they’re sold in your community. We really love this toy and think you will too. Let us know what you think on either our Facebook Page or Tweet Us! Or you can leave a comment below. We’d love to hear from you and know what you think about our reviews, what you’d like to see, what toys are your favorite — just anything you’d like to share. But even so, we all have fun anyway! p.s. It says on A Cheerful Pet‘s website that Proverbs 12:10a says, “A righteous man cares for the needs of his animal.” So, it’s in the Bible so you kinda hafta get one. We’re just sayin’ . . . .
Hey, we’ve been going through some changes – both Dads are working from home now and apparently Oliver is staying forever and it’s been a little wacky around the Buck-White house. But we’ve started hiking every Sunday (have you seen the pictures on Facebook?) And we still love our toys. One of our ABSOLUTE favorites? 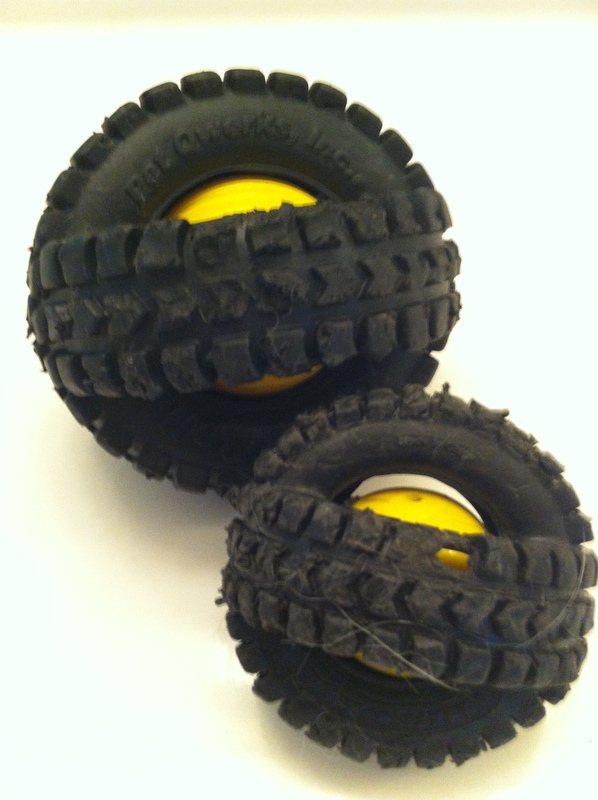 This guy – the PetQwerks Animal Sounds X-Tire Ball. You cannot possibly understand how totally, fundamentally, amazingly awesome this toy is. It comes in two sizes – large and small (5″ and 3.5″). 1) As you can probably tell from the video, we love, love, love to chew it. But it rips off in little pieces sometimes so we’re really not allowed to hold on to it for long. A game of fetch or running around with it, but we shouldn’t be left alone with it. 2) Apparently the human Buck-White Boys don’t like it when it’s left in random places and they stumble over it in the middle of the night. Something about “Bleepity bleep blankety blank blank Aunt Kathy that brought that bleepity bleep bleep ball with that blankity bleep monkey noise” or something like that. We think its funny. You can order ’em from Amazon or some of the big box pet stores or even, sometimes, at HomeGoods or Marshall’s. Best Pet Store in the World!